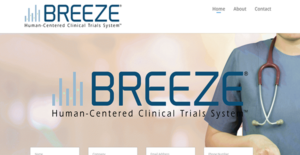 BREEZE CTMS is a modular clinical trial software that highlights human involvement in task automation. It serves as a repository for digital documents for you to eliminate paperwork and to simplify your workflows. With it, you can reduce and even eliminate errors and ensure that every field in forms have entries. Each component of BREEZE CTMS also seamlessly integrate with each other. This strong connection between them lets the software predict and automate your entries and actions for the swift completion of tasks. Moreover, BREEZE CTMS has a built-in task manager. Instead of the standard and passive to-do list, the application gives you a dynamic tool that intelligently and automatically generates action items and tracks their completion progress. With this, you can be confident in fulfilling protocol and workflow requirements. BREEZE CTMS helps you eliminate paper from your workflow. From there, you can systematize your work processes and simplify the completion of tasks at every stage. Since BREEZE CTMS also digitizes data entry, you can rest assured that you and your staff commit fewer errors and miss no document field. Instead of working with eSource documents that are lacking fields you require or have too many boxes you do not need, you can request custom, study-specific forms from BREEZE CTMS. The clinical trial experts behind the software can create tailored files that meet your study needs. BREEZE CTMS goes beyond automatically complete document entries. It anticipates the next actions you would take based on your inputs in the system by instantly completing further tasks. This allows you to enhance your efficiency and lets you reduce oversights. With BREEZE CTMS, you have access to an intelligent and dynamic task manager. It serves as your to-do list but it also automatically tracks the completion of tasks. Aside from that, the tool helps you accomplish protocol processes by automatically creating action items for you to follow through. The BREEZE CTMS accounting module closely coordinates with other components. It automatically captures items for invoicing for speedy financial administration and management. BREEZE CTMS comes with an intelligent report assembler that lets you record Serious Adverse Advents and study deviations in a few minutes. With this, you can apply remediation immediately as needed to get the research back on track. Instead of spending more time transcribing research data into your EDC system, you can employ BREEZE CTMS in transmitting information. The solution interfaces with Medidata Rave to assist you in that regard so you can expeditiously report to sponsors and gain their approval. If you are considering BREEZE CTMS it could also be beneficial to examine other subcategories of Best Clinical Trial Management Software collected in our base of SaaS software reviews. Each business is different, and might require a special Clinical Trial Management Software solution that will be fit for their business size, type of customers and employees and even individual niche they support. It's not wise to count on getting an ideal software that is going to work for every company no matter what their background is. It may be a good idea to read a few BREEZE CTMS reviews first and even then you should remember what the solution is supposed to do for your business and your employees. Do you require an easy and intuitive solution with just essential features? Will you really use the complex tools required by pros and large enterprises? Are there any specific features that are especially practical for the industry you work in? If you ask yourself these questions it is going to be much easier to get a trustworthy service that will fit your budget. How Much Does BREEZE CTMS Cost? BREEZE CTMS is a clinical research tool that is human-centered. For custom enterprise pricing, get in touch with the company by phone, email, or web form. We realize that when you make a decision to buy Clinical Trial Management Software it’s important not only to see how experts evaluate it in their reviews, but also to find out if the real people and companies that buy it are actually satisfied with the product. That’s why we’ve created our behavior-based Customer Satisfaction Algorithm™ that gathers customer reviews, comments and BREEZE CTMS reviews across a wide range of social media sites. The data is then presented in an easy to digest form showing how many people had positive and negative experience with BREEZE CTMS. With that information at hand you should be equipped to make an informed buying decision that you won’t regret. What are BREEZE CTMS pricing details? What integrations are available for BREEZE CTMS? BREEZE CTMS has a strong integration with Medidata Rave.